The Washington Post Company announced Monday it was selling its newspaper business, including the flagship Washington Post, to Amazon.com founder Jeff Bezos for $250 million. Bezos, whose net worth has been estimated at over $25 billion, is acquiring the Post personally and not through Amazon.com (AMZN). He is gaining control of the newspaper from the Graham family, which has led it for decades. The Post Company will change its name as part of the transaction, though a new name has yet to be announced. Shares rose 5.5% in after-hours trading Monday. Washington Post Company (WPO) CEO Donald Graham said he and the rest of the company's leadership "decided to sell only after years of familiar newspaper-industry challenges made us wonder if there might be another owner who would be better for the Post." "Jeff Bezos' proven technology and business genius, his long-term approach and his personal decency make him a uniquely good new owner for the Post," Graham said in a statement. 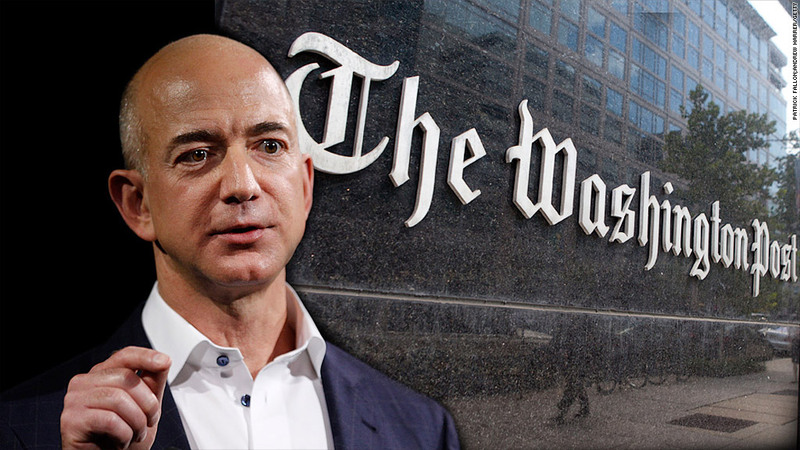 Bezos said in the statement that he understood "the critical role the Post plays in Washington, DC, and our nation." "Our duty to readers will continue to be the heart of the Post," he said. Bezos invested earlier this year in the financial news site Business Insider, and is also the founder of commercial space flight company Blue Origin. He has asked Katharine Weymouth to stay on as publisher and CEO of the Post, and Martin Baron to remain as executive editor, saying in a memo to employees that he will not be leading the newspaper day-to-day. The deal also includes the Express newspaper, The Gazette Newspapers, Southern Maryland Newspapers, Fairfax County Times, El Tiempo Latino and Greater Washington Publishing. The Post Company will maintain its ownership of media titles including Foreign Policy magazine, online magazine Slate and TheRoot.com, as well as education company Kaplan. It will also hold onto real estate assets including the Post's headquarters in downtown Washington, as well as cable operator Cable One and the Post-Newsweek network of television stations. Among the Post Company's largest shareholders is Warren Buffett's Berkshire Hathaway (BRKA), which held roughly 23% of its common shares as of March. Buffett himself served on the company's board until 2011. The Grahams control the company through their holdings of Class A stock. Bezos wrote in his memo to Post employees that the paper "will need to experiment" in the years to come, adding that he was "excited and optimistic about the opportunity for invention." "The Internet is transforming almost every element of the news business: shortening news cycles, eroding long-reliable revenue sources, and enabling new kinds of competition, some of which bear little or no news-gathering costs," he wrote. "There is no map, and charting a path ahead will not be easy." The news follows the New York Times Company's (NYT) announcement just days earlier that it had sold the Boston Globe for $70 million to sports magnate John W. Henry. Digital news company IBT Media, meanwhile, announced on Saturday that it had acquired the rights to current-affairs magazine Newsweek for an undisclosed sum. For most of its 80-year history, Newsweek was owned by the Washington Post Company, which eventually sold it to audio industry pioneer Sidney Harman in 2010. It was later sold to media firm IAC (IACI), which abandoned the magazine's print edition last year. CNN's Poppy Harlow contributed reporting.